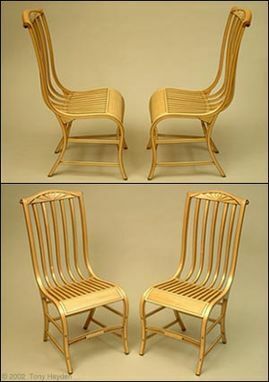 These Side Chairs are based on a chair designed in 1810 by the Boston furniture maker Samual Gragg. 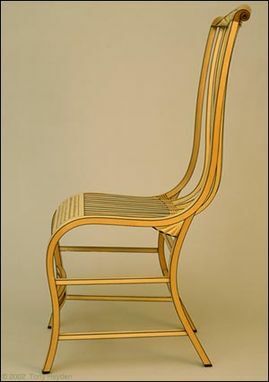 Originally touted as an "Elastic fancy parlor chair," the chairs were steam bent and painted with fancy peacock plumes and fans. Some versions of the chair had goat feet front carved legs. 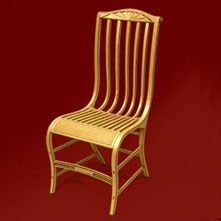 In my version of Samual Gragg's chair, I built the chair bent and laminated, not painted. I used sequentially Sawn Rift Hard Maple for the laminations to give continuity to the grain match. The front curved stretchers, seat rails side rear seat blocks and crest rails are veneer with a sand shaded fan motif. Every corner has a black inlaid edge. The crest rail is shaped and carved with the ends inlaid with black edging terminating with a carved volute. The finish is oil rubbed finish. Dimensions: Height: 38" Width: 19" Depth: 26"